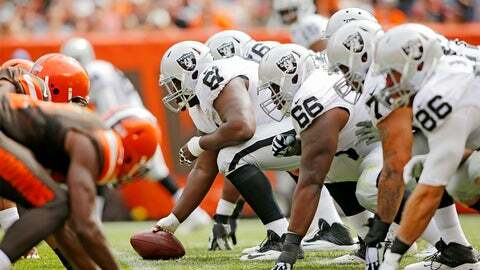 For 15 seasons, Oakland's offensive line was a glaring weakness. It's now a strength. Jack Del Rio dialed up an old friend as soon as he became Raiders boss. That phone call — the one that drew Mike Tice to the Bay Area — might ultimately define a bounce-back season. Tice, the team's new offensive line coach, teaches the league's top pass protecting line, according to Pro Football Focus. The starting five has allowed excess pressure on 17 percent of its plays. And that mark factors in an outlaying four-sack game vs. Denver last weekend. It's shocking that the Raiders call this group a strength. It lost Menelik Watson, the starting right tackle, in training camp. Plus, starting right guard J'Marcus Webb was out of football last year. Tice deserves a ton of credit. He recognized the potential in his players long before other teams would on Sundays.